Creation: US 58 Business for Virginia Beach appeared May 1958 (CTB) as a renumbering of VA 164 (although it had been mainline US 58 in an earlier time) on Virginia Beach Blvd from Laskin Rd to Pacific Ave. Improvements: Paved upon inception; The first official map to show it multilaned was 1986. Posted: Fully posted, though less well at the oceanfront. Comment: US 58 Business is the oldest Business designation in Virginia. On early officials (for some reason appears starting in 1957) the Business is actually shown in a separate banner! Creation: US 58 Business for Lawrenceville appeared in June 1963 (CTB) when US 58 was placed on new expressway south of town. Comment: US 58 Business has a few turns just west of downtown. East of downtown it is also posted as TRUCK VA 46. Creation: US 58 Business for Gate City appeared in Oct 1966 (CTB) when US 23-58-421 was placed on new expressway south of town. Creation: US 58 Business for Suffolk appeared in Oct 1974 (CTB) when US 58 was placed on new freeway north of town. Improvements: Paved upon inception; Multilane from VA 10 eastward upon designation. Official maps since 1975 erroneously show the entire route as multilane. Comment: Some postings are now in LGS unisign format. Creation: US 58 Business for Boydton appeared July 1978 (CTB) when US 58 was placed on new expressway north of town. Comment: US 58 Business in Boydton still has very vintage concrete as its paving surface. Creation: US 58 Business for Franklin/Carrsville/Holland appeared about 1982 when US 58 was placed its new alignment south of these towns. Adjustments: The traffic log shows US 58 Bus split (but not on one-way streets) in Franklin: EB uses Clay/4th St and WB uses 4th St/High St/Lee St/Clay St. The CTB showed mainline US 58 using the WB routing starting in 1970 and I have not found any reference restoring the current EB routing. Improvements: Paved upon inception; Multilane from US 58 west of Franklin to a little short of 4th St.
Posted: Fully posted; cutout on US 258 Bus NB at College St. Comment: Much of this US 58 Business is still rural with 55 mph speed limits. Creation: US 58 Business for Courtland appeared about 1984 when US 58 was placed on new expressway south of town. Improvements: Paved upon inception; Multilane on the easternmost half-mile of so. Comment: US 58 Business is a frequent flood casualty in the area of the Meherrin River Bridge. Creation: US 58 Business for Emporia appeared Dec 1987 (CTB) when US 58 was placed on new expressway north of town. Comment: US 58 Business has a direct ramp from I-95 NB that does not require being on mainline US 58. Creation: US 58 Business for Martinsville appeared about 1993 when US 58 was placed on freeway south of town. Creation: US 58 Business for Ewing/Rose Hill appeared July 2000 (CTB) when US 58 was placed on new alignment north of these towns. Comment: US 58 Business is erroneously shown as multilane on the 2002 Official. Creation: US 58 Business for South Hill appeared about 2002 when US 58 was placed on new expressway south of town. 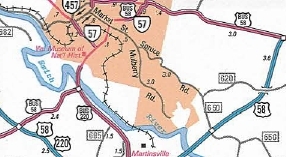 Comment: US 58 Business could be eliminated here with the extension of VA 47. Creation: US 58 Business for Stuart appeared about 2003 when US 58 was placed on new expressway north of town. Creation: US 58 Business for Danville appeared about 2005 when US 58 was placed on freeway south of town. Creation: US 58 Business for Clarksville appeared about 2006 when US 58 was placed on freeway south of town. Comment: The traffic log says VA 49 goes this way, too but it is fully posted on the bypass, while US 15 is clearly posted to remain through town. Creation: US 58 Business for Meadows of Dan appeared about 2006 when US 58 was placed on expressway north of town. Comment: There is really not much to Meadows of Dan. The 58 Business designation may solely be to provide access to the Blue Ridge Parkway, which 58 bypass cannot do. Creation: US 58 Business for Hillsville appeared Aug 2011 when US 58 was placed on a new expressway south of town. 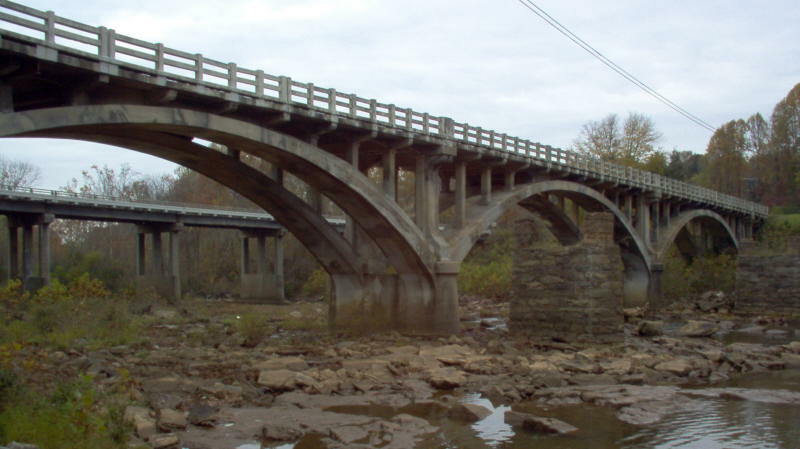 Comment: Hillsville had always been a tough slog for US 58 through traffic.